Some people end up confusing video poker with slot machines. The make and look of both is very similar, but the game play is entirely different. Slot machines are based on pure luck. You insert a coin pull the lever and wait for the result. There is a significantly high house edge when it comes to slot machines. In video poker, as is the case with most skill based games in a casino, if you play optimally you can reduce the house edge a lot. Video poker in a way is a hybridized version of a slot machine and a table game. Video poker is basically based on the rules of Draw Poker and everything is the same except for the fact that you are not playing against any other player. To begin the game, you insert a coin or a credit ticket in the machine; decide for how much credit you want to play for, and then press the deal button. 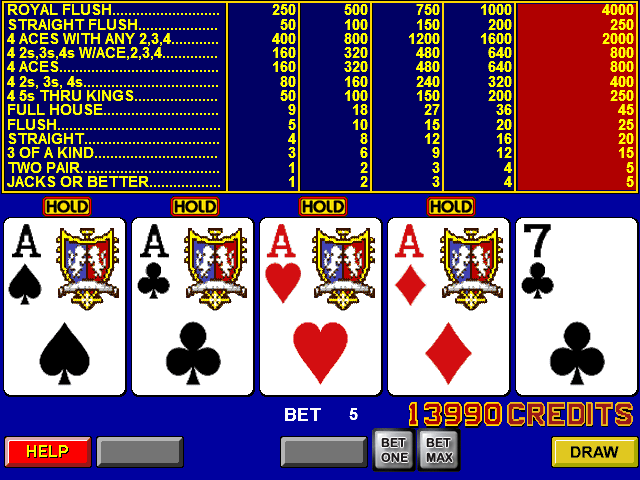 The player is presented with 5 cards on the screen drawn from a virtual deck. If you are unhappy with the combination that you have, you can discard some of the cards. All you have to do is press the hold button for the cards you require. After that, press the deal button to get new cards for your discarded cards. Once you are satisfied, you press the draw button and you have your payout, which is based on a pay chart posted in front of the machine. Pay charts are essential if you want to maximize your winnings. This is one advantage that you have while playing video poker over slot machines. You can actually determine the return of the game by reading the pay charts. There are approximately 2.5 million hands that a machine can make using a standard 52 card deck. The machine is set to draw one of these possibilities. There is a set probability of drawing a particular hand, so the casino adjusts the pay charts on the machine to get the edge. There are various variants of video poker and all of them require a unique strategy. You cannot use one strategy for all the games. So there are strategy-charts available online for all of these games, which help you play the game optimally and maximize your winnings. Let us take an example of how this works. Suppose you are playing Jack or Better on a video poker machine and you are dealt a hand of 3 of hearts, 3 of clubs, 9 of hearts, 5 of hearts and queen of hearts. You might be tempted to cash out on the low pair that you have but strategy-chart will tell you that you should continue playing with the flush of four cards that you have. Video poker games are now available in hundreds of different variants which are all based on draw card rules. These variants are divided into two categories – high pay games and low pay games. High pay games are those that offer a return of close to 100% and sometimes even more than that. Deuces Wild is one such high pay game. It is named so because all the deuces or 2 cards are wild cards and can take any value to improve your hand. Jacks or better another high pay game is the most commonly played video poker game.